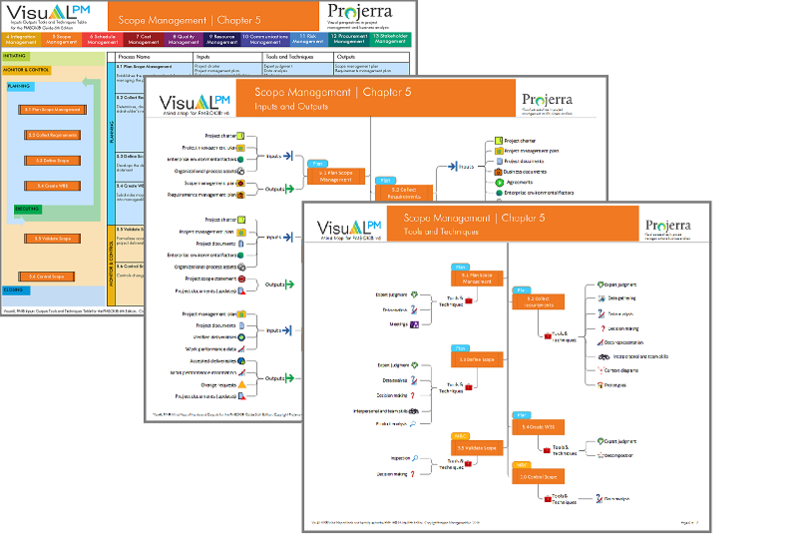 VisuAL PM® (Visually Assisted Learning for Project Management) is a suite of products that apply color and graphics to represent the relationships between the process groups, knowledge areas, processes and input/output documents in a visual manner. The graphical presentation allows you to see the associations between the processes and the various input and output documents. VisuAL PM® products help you see the big picture. Recently updated for PMBOK® version 6. 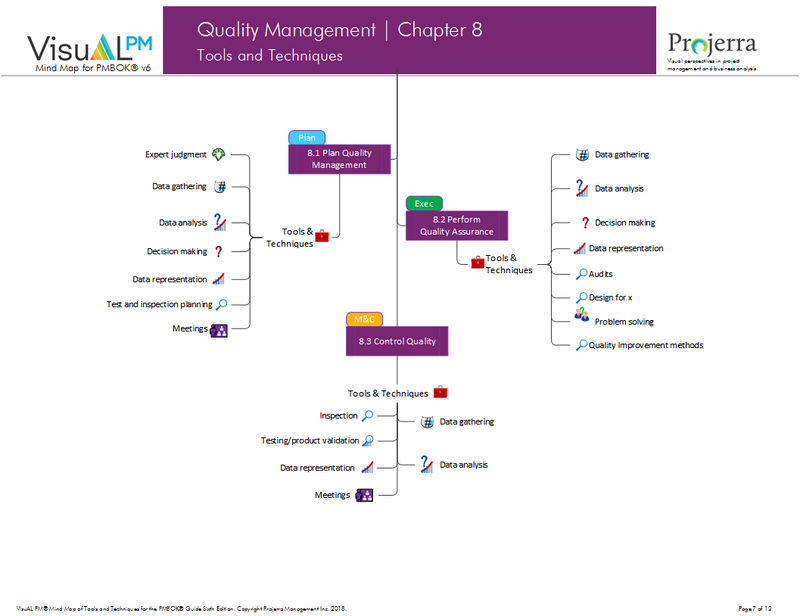 All five VisuAL PM® products combined in one package to help you master the exam. 1) VisuAL PM® Table for Inputs, Outputs, Tools and Techniques, 2) VisuAL PM® Mind Map for Inputs and Outputs, 3) VisuAL PM® Mind Map for Inputs and Outputs (Extended Edition), 4) VisuAL PM® Mind Map for Tools and Techniques, and 5) VisuAL PM® Mind Map for Tools and Techniques (Extended Edition). Five amazing, vivid and visual products to help you understand and internalize all the details required to ace the exam. Purchase all five products and SAVE an ADDITIONAL 20% over the already discounted price!! 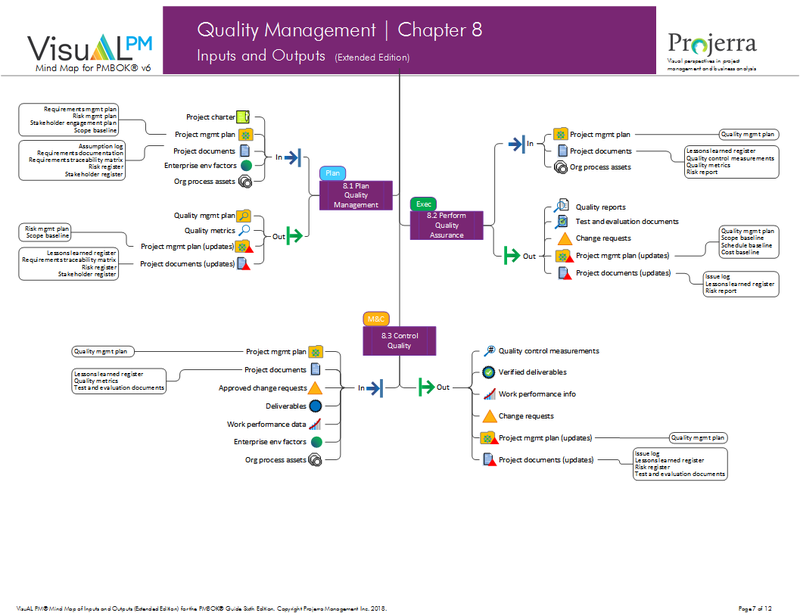 Our popular VisuAL PM® Mind Map for Inputs and Outputs (Extended Edition) and VisuAL PM® Mind Map for Tools and Techniques (Extended Edition) combined with the VisuAL PM® Table for Inputs, Outputs, Tools and Techniques combined in one package. Three vivid products, with extra detail and insight, to help you recall and see the relationships. Purchase all three products and SAVE an ADDITIONAL 10% over the already discounted price!! 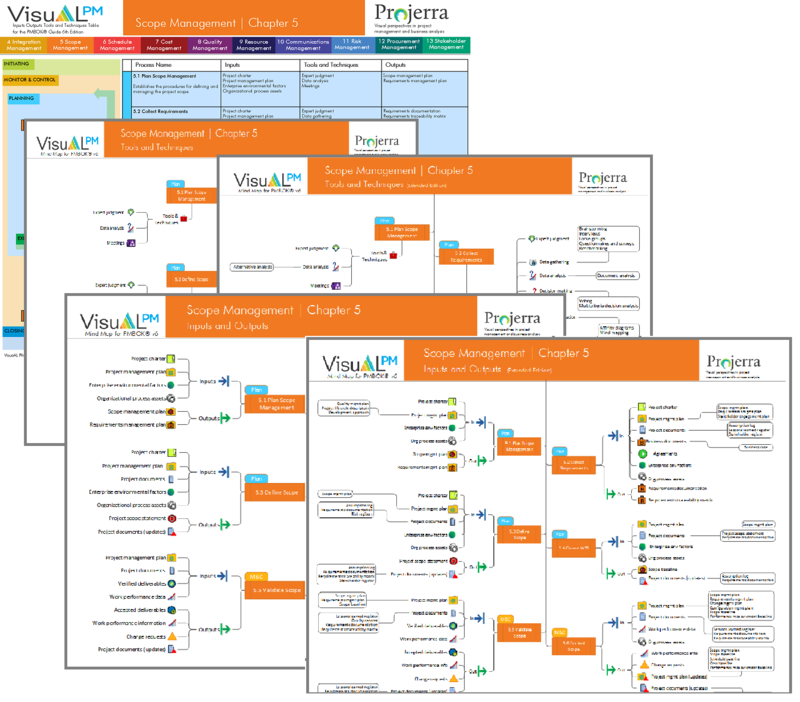 Our core products, the VisuAL PM® Mind Map for Inputs and Outputs, the VisuAL PM® Mind Map for Tools and Techniques, and the VisuAL PM® Table for Inputs, Outputs, Tools and Techniques combined in one package. Three vivid products to help you recall and see the relationships. A collection of ten tables (one for each knowledge area), describing the processes, inputs, output, tools and techniques of each knowledge area by process group. Each page contains an image and a table. The image illustrates the processes of the knowledge area. The table summarizes the inputs, outputs, tools and techniques associated with the processes. The image and table are both color coded by process group to help you identify and recall information. 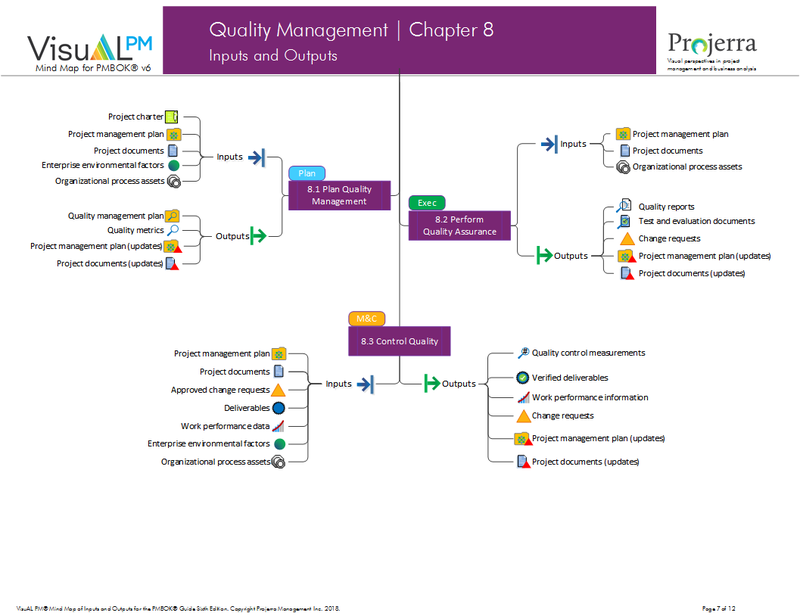 Also included is one summary table that summarizes all processes by knowledge area and a summary chart that illustrates all processes by process group. Available as a PDF for you to print at home or use with your laptop or tablet on the go. 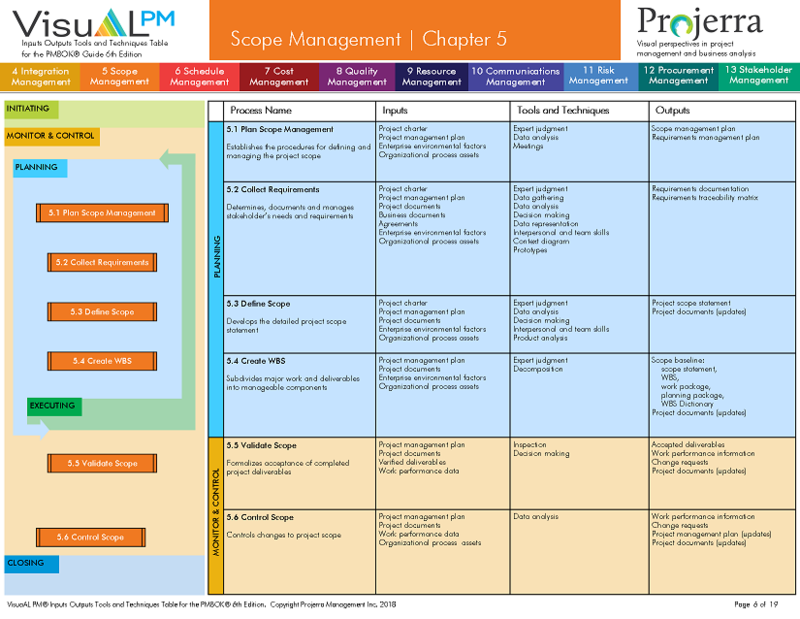 Download FREE sample of VisuAL PM for PMBOK v6! A VisuAL Mind Map in PDF format. The map consists of graphical images and colors to help you to make a mental image of the relationships between progress groups, processes, input and output documents. Additional details regarding the specific input and output documents associated to the process are provided in the bubbles connected to the mind map. Explore the concepts and terms associated with each knowledge area. Available as a PDF for you to print at home or use with your laptop or tablet on the go. 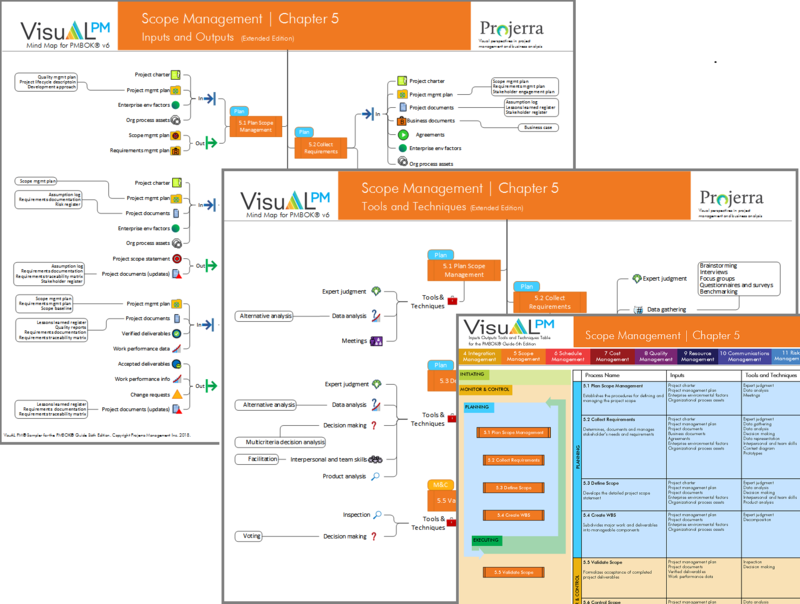 A VisuAL Mind Map in PDF format. The map consists of graphical images and colors to help you to make a mental image of the relationships between progress groups, processes, tools and techniques. Additional details regarding the specific input and output documents associated to the process are provided in the bubbles connected to the mind map. Explore the tools and techniques associated with each knowledge area. Available as a PDF for you to print at home or use with your laptop or tablet on the go. A VisuAL Mind Map in PDF format. The map consists of graphical images and colors to help you to make a mental image of the relationships between progress groups, processes, input and output documents. Explore the artifacts associated with each knowledge area. Available as a PDF for you to print at home or use with your laptop or tablet on the go. A VisuAL Mind Map in PDF format. The map consists of graphical images and colors to help you to make a mental image of the relationships between progress groups, processes, tools and techniques. Explore the tools and techniques associated with each knowledge area. Available as a PDF for you to print at home or use with your laptop or tablet on the go.